The shaded canopy of a tree provides the most modest form of shelter that leaves us open and connected to the natural world. 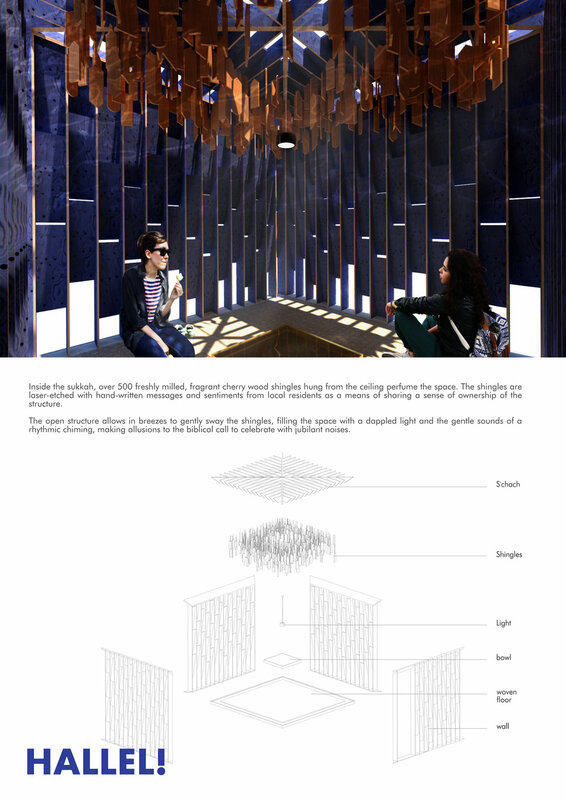 This sukkah alludes to this sensation while bringing together the historic elements of Sukkot; light, water and festal celebrations. Blue in many cultures is a symbol of celebration. The main structure of the sukkah is formed entirely from sheets of plywood, thick enough to give strength and to standardise its construction. The floor of the sukkah is formed from woven natural fibres, indicating its connection to the broader agricultural theme of the festival. Prior to completing his MA in Architecture, Abre gained a significant amount of experience in his home town of Leeds, working for 2 young architecture and design companies. With a strong background in design, Abre has entered several design competitions, receiving a number of awards. He has also exhibited his work in places such as the Design Museum in London, The Cube Gallery in Manchester and the Royal Scottish Academy in Edinburgh.